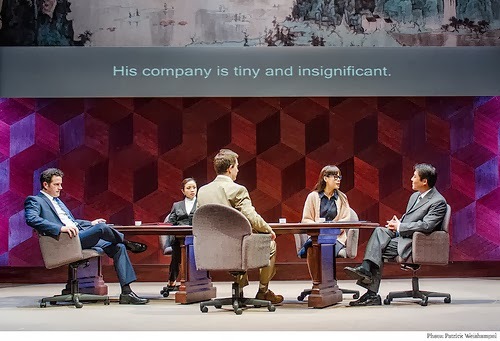 That's the theme that comes to mind watching the Portland Center Stage production of Chinglish, where American Daniel Cavanaugh (played by Peter O'Connor) tries to finesse a moneymaking deal in China. Since he doesn't speak Chinese or have the least idea of the culture, Brit Peter Timms (Jeff Locker) comes to his rescue, offering to coach him through negotiations. 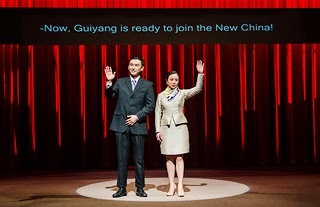 Those negotiations take on a different meaning when Daniel meets Xi Yan (Tina Chilip), the beautiful Vice Minister of Culture, and their chemistry sizzles - in spite of the fact they don't quite understand one another. Then again, maybe their attraction is because of that fact. Each can pretend they are hearing what they want to hear. The technical details were wonderful, including the subtitles shown overhead. We could read the outrageous ways language runs amok. The Chinese interpreter, played by Rachel Lu, was jumpy, unnerved, and wrong about everything - absolutely hilarious, and the character I loved most. And there was romance - but this was far from a romantic comedy. It was unsettling. Not every work of art has to be emotionally satisfying, though. It can be a great service when a play makes a person think. What we see is how Daniel pursues being understood, making money, and finding love, the same way most of us do - Americans anyway. It's all about getting what we want, and using language as a tool. As the play unfolds, even our laughter sounds hollow as we notice how words are misconstrued, and how little anyone seems to truly know or care about anyone else. Remember those words of St. Francis? Well, that's not happening here. Yet there is one moment when Daniel looks into the face of Xi Yan. "I can see that it's important in your face," he says. "What are you trying to tell me?" It brings up the question: Can we look past our own needs and wants and connect to cultures and ideas bigger than we are? As Oliver Burkeman writes in The Antidote: Happiness for People Who Can't Stand Positive Thinking, "There are good reasons that the whole notion of 'seeking happiness' is flawed to begin with." We lose so much when putting ourselves first. Faced with the opportunity to learn about another human being, or an entirely different culture, can we take the time to listen? Can we serve rather than exploit? Can we seek to understand? Well, I guess I've got my work cut out. This is about me, after all.